Stakeholder management is a critical aspect of running a successful IT department. Info-Tech's CIO Business Vision program is a low effort, high impact program that will give you detailed report cards on the organization's satisfaction with IT’s core services. Use these insights to understand your key business stakeholders, find out what is important to them, and improve your interactions. Ken Platt is the shared services CTO of Learning Resources Inc. and leads an IT group that serves over 350 people. He used the CIO Business Vision diagnostic over 3 years to drive a 20% increase in stakeholder satisfaction and became a strategic business partner. Frank Adili is the IT leader at the Town of Milton and is responsible for supporting Town services including: Corporate Services, Community Services, Planning and Development, Executive Services, Engineering, and Fire. With the growth and demand, Frank knew he needed to use data to understand the business and drive innovation. 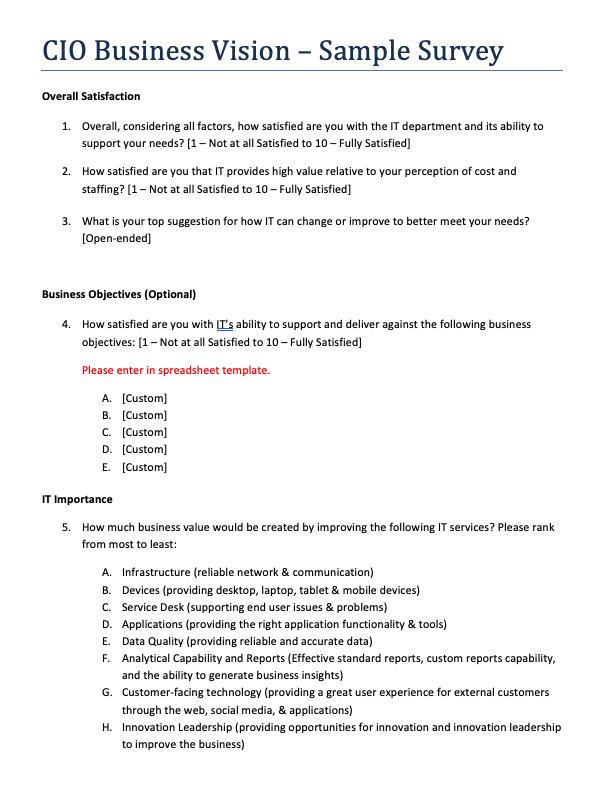 A scorecard that measures the satisfaction of your key decision makers annually. No activity or project is more important than showing the company you care enough to measure its satisfaction once a year. A capacity scorecard that shows the demands on IT by each department. The business is the one that demands more resources. Prove the demands on IT from the business and make the case for more resources. Individual department scorecards which measure the satisfaction of each department. Work with your most important and most dissatisfied stakeholders to ensure their needs are met. You can use this view to compare the departments by Satisfaction Capacity and Dependency scores. Prioritize which departments to focus on first. New question set covering appropriateness and importance of cybersecurity practices as well as business feedback on friction created. Measure the business impact of security practices to ensure they’re appropriate. Pinpoint which areas cause the most pain and adjust accordingly. Beyond providing IT Services, IT must support and deliver against Business Objectives. Collect business leader feedback on how IT is supporting and delivering against your organization’s key objectives. Demonstrate the business value of IT to earn your position as trusted partner. Uncover where opportunities exist to better executive against business needs. Internal scores are useful, but how you sit among peers provides meaningful context. Comprehensive industry benchmarking against your peer group so you can see where you stand against our database of 85,000+ business leaders across 900+ organizations. Context is everything – demonstrate how you are performing against your peers to provide the most accurate picture of your achievements and opportunities. Reading the Report is not enough. You need to Get to Action. Get access to a curated selection of Info-Tech resources to help you make progress against your key initiatives emerging from this exercise. Measuring satisfaction is just the first step. Use our resource to build an IT strategy, stakeholder management plan, IT performance methodology and improve core IT services. Info-Tech's core CIO Business Vision is set up to apply to all organizations. 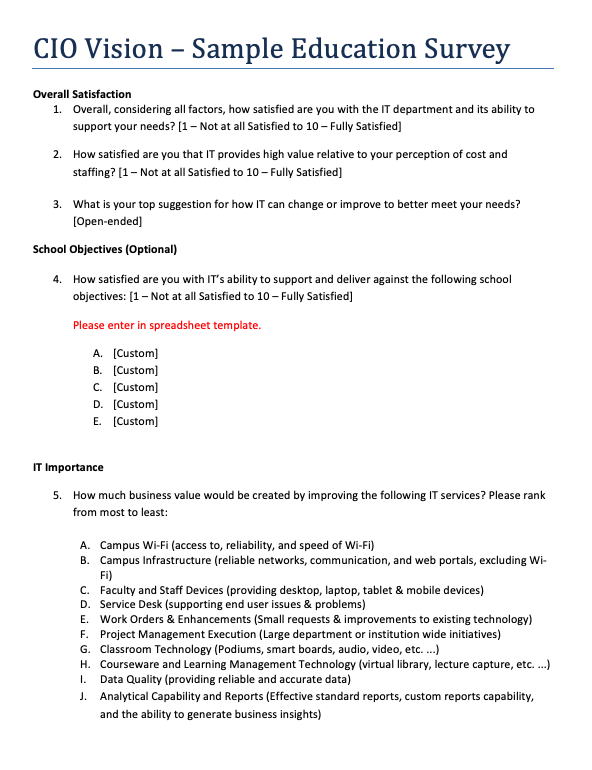 Download a sample of the survey and report card you will receive from Info-Tech's core offering. Info-Tech also has an education focused offering that applies directly to CIOs in the education sector. Click below for the samples of the education survey and report card. Get started on the CIO Business Vision. Start collecting the participants for your survey by using this template. Get started on the CIO Business Vision. Start customizing your emails by using this template. This is ongoing, so it's too soon to tell. Dana has been great – above and beyond what I'd expect, so I'm eager to move forward. Best: The consolidated report with highlighted performance measures is excellent. Worst: The email list that my staff put together caused issues. This is my area to deal with. + Insight and ability to leverage data. - Should send base documents along with PDFs. This will allow organizations to manipulate and reuse content without any translation issues. Best: Speed and reach. Worst: Would love to see benchmarking as part of the report (as opposed to separately in spreadsheet). Provides you with an independent interpretation of the results. Always a great discussion on "what the data says" is where I should focus and what tools or reference materials are available to assist in developing a plan of attack. Great to see how effectively, or not, prior year changes are affecting the results. The best was getting an opportunity to see the survey results and discuss with my peers. The worst part was that we should have pushed for more participation from those we wanted to survey. The Institute of Professional Practice Inc. This jump started a re-organization within IT, how IT is governed, how IT focuses on strategic objectives, and how IT returns value to business operations. The survey results supported the need for these changes and gave the supporting data. Setting up my survey was a breeze. The delivery of the results was also first class. The result of the survey is fantastic and provides me a good start to assess my services. The survey or other tools should be bilingual as that would have helped me to ease the process. I had to send two surveys and initially I got two sets of reports which was not good for the analysis since it has been updated to one. I would appreciate to get a peer review with my results for being able to assess my next priorities. Kelly Dohan was really supportive in managing the day-to-day survey operations. The reports coming out of the exercise are clear and easy to use. I would appreciate receiving the report in a format that I could use to extract data for presentation. Excellent list of categories to determine priorities and perceptions. The process was very well done and easy to follow. The review lacked an understanding of the strategic challenges that CIOs face with cyber-security. These challenges will have an impact on the overall strategic initiatives and should be discussed in the context of strategy and vision. The best aspects were reinforcing what I was aware of and providing a tool to use to lobby for additional resources. The worst aspects are seeing concerns about areas beyond our control but at least this identifies the concerns and provides us with a means of addressing them. Easy to implement and true to the term "turn-key." Working with Dana on the summary was a great experience. This was not something that we were planning on doing until contacted by Info-Tech so the days and costs specified are just guesses. I was impressed by the wealth of information that was gathered and the concise presentation. I am excited to present this to management. The year-on-year comparisons is where the tool really becomes invaluable as trends become visible as well as the effectiveness of previous years' action plans. I also appreciated the turn key approach that required minimal resources on my part or the part of my team. The CIOBV survey is excellent and I think our customers will find great value as they dig deeper into the results. This survey I'm doing now doesn't seem to correlate. Am I rating the person who did my review call? No relevant questions. Am I rating the CIOBV survey experience? No real relevant questions. So not sure about this part. There was some missing attention to detail regarding the company name on the first couple of emails, but that was resolved. The team then responded quickly to all my needs and the review was very comprehensive. Kimberly was able to clearly explain and articulate each aspect of the survey and share her perspective on how our results compare with others. In the beginning, I think Kimberly or Justin could explain more about how this item fits into the overall roadmap for our company, but it may have been too soon for that discussion. CIO Vision Survey was a great tool that aided in the confirmation of the current state. Bob, Ross, and Dana were excellent to work with and the visual reporting of the results was super. Good overview of findings, and some good background on bizarre numbers. A little too late to effectively impact next survey, but not due to Eric but Info-Tech's management of the account. Provide great third-party insights on the service we provide. I don't like the anonymous comments - I think that participants need to be accountable for their comments. Definitely showed areas for improvement. It was great – well done output and analysis. It would be nice to get more "comparison info" on the surveys (in relation to peers' information). Best: It was really quick and the results are more revealing than expected; worst: the participation rate. Helpful to compare these results with our end-user survey. The best part was how Info-Tech was able to customise the survey just how we wanted it. The worst part was the process of determining how it should differ from the survey exemplar/template. The answers are best guesses as I am at the beginning of the project and as a result are quite subjective in nature. That being said, I have found the exercise useful to date and it supports other data sets that I have as well as opinions I have gathered. The support from Info-Tech was great. The whole experience was pretty seamless and easy to implement. Good sanity check with the company by having an independent review. I appreciate the 20k+ company reviews that have been done by Info-Tech to see how we, in general, compare. A lot of information to follow up on which provides an action plan. Excellent package of results. Communication was great. Best: Info-Tech always provides us directions on what we need to do. Worst: Not the worst, but the background of the company should be considered to relay inputs which may be more suitable than others. Gave direction to the study; didn't have to draw out the conclusions from all the data and the action steps to take. Best bit – it was very easy. Worst – my users found it reasonably challenging to complete the survey; a common complaint was they struggled to fully comprehend the questions at times. All aspects have been positive. Toyota Tsusho South Pacific Holdings Pty Ltd. Experienced insights shared by Carlene and Eric. Great presentation of some really insightful information. Jason has expertise with the tool and results from other organizations. Best: Results and the survey delivery. Worst: The initial setup of the survey was not smooth. The team was well organized and executed the project very well. The survey and survey reports were great. The only improvement needed is the email notification to survey participants. External emails with links were often treated as phishing emails. The overall process was quite good and minimized the amount of time I had to spend gathering data and compiling it. Andy Woyzbun was excellent at reviewing the results with me and providing perspective on the meaning and significance level of various items. It was really valuable to have someone who could give me feedback as to how the scores compared with other businesses. I highly recommend the process and Andy. It was a great experience and I would recommend this to my peers. Very insightful. For me, it was great to reinforce what I knew and have planned. It also gives me data to take to my boss and CFO regarding priorities and staffing needs. We received some great feedback and a detailed list of action items from Info-Tech. However, some users found the survey to contain too much technical jargon. We'll need to reword the questions in the future if we want to continue to receive a high number of responses. Thanks again. The Info-Tech team is great to work with; survey launch and results process is smooth. It was challenging getting the survey launched in both official languages. Best: Having our results benchmarked against other Canadian cities. Worst: We communicated the survey a few days prior to it being "live," so some keen customers' feedback disappeared into a test database, and the customers showed up as not having replied at all. Over the last few months, working with Info-Tech has been a phenomenal experience. The individuals, specifically Tina, Dana, Eric, and Dina (hopefully, I haven't forgotten someone) I have met and worked with have answered all my questions and catered everything to the needs of our institution. This process has provided me with tons of feedback and data that I can use to guide our IT strategy moving forward. In addition, this process has allowed me to share our challenges and frustrations and gain insight from talented and knowledgeable individuals. It has saved me countless man hours in research and data analysis. I would recommend Info-Tech to anyone! Thank you for catering to our individual needs and being patient with us as we learn to challenge our processes and change our organization for the better. The overall experience with Info-Tech has been very good. From beginning to end, the team at Info-Tech has been very supportive. The challenge is the volume of data and the interpretation and context of data. One area which would really help is to have a written explanation for each category, and how they should be interpreted. For example, a description of satisfaction and value, their relationship to each other, and how they should be interpreted would be very helpful. As well, the core services overview showing the importance variation and the satisfaction variation is confusing. I'm not sure I follow what it means. All good. My face-to-face discussions with individuals will be interesting. The Info-Tech team was absolutely fantastic to work with – I have nothing but praise to offer in my comments. It was a lot of work coordinating on my end to make sure all of the agencies provided accurate data, but I feel next year will be much easier. Dollar value is difficult to estimate since I have no previous experience conducting a survey. CAA South Central Ontario Systems and Services Inc. The best part is that this is conducted externally, and all the questions are already there. There is no worst part. The piece that can be improved though is to provide benchmark comparison so that we know how we fair against other organizations in order to help prioritize improvements. The quality of the deliverables was the best aspect. The worst part of the experience was communication and coordination with our staff. Reports seemed to be rushed out and we had to request some re-dos to improve our response and groupings. Having Info-Tech coordinate sending, receiving, and the results saved us time of having to do it internally. Also having survey questions at the ready saved us time in conducting the survey ourselves. The output was good information and helped us to see areas needing improvement. Generated good conversation and has set up discussions to move forward but confirmed some of our expectations are not set at the right level. Had I attempted to do this on my own it would have taken forever, and I might have gone down paths I didn't need to go on. It was a great experience overall.